The precision sealed linear encoder L35 is used to convert linear displacements of key machin components into electrial signals containing information about the value and direction of the displacements. 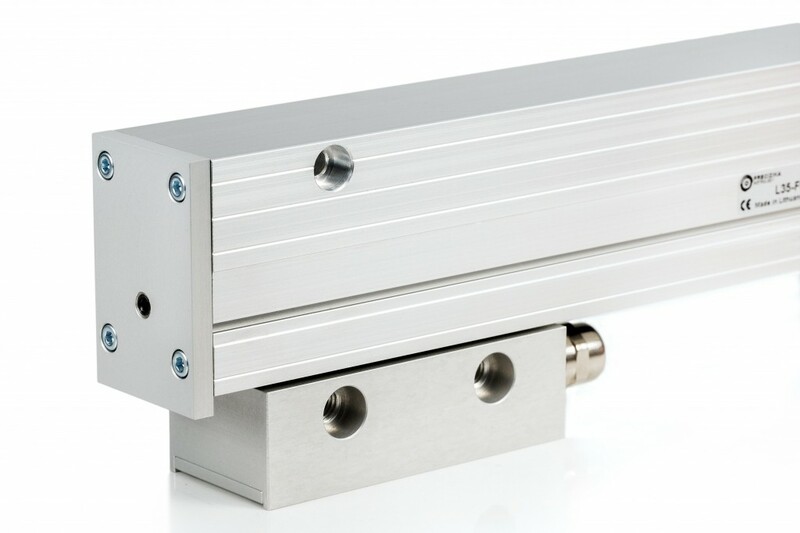 The encoder consists of a glass scale installed into a rigid hollow housing and a ball-bearing-guided reading head. To be able to work in harsh environments (cooling liquid, lubricants and chips), the encoder has two rows of sealing lips. Filtered air ca be supplied into the housing of the encoder for extra protection from dust. Reference mark can be selected by magnet, which moves in horizontal groove on the front side of the encoder. Applications include Robotics, Medical Equipment, Retrofitting, Coordinate measuring machines, Turning Machines and centers, CNC Cutting Machines, Milling/ Boring/Drilling CNC Machines, Electronic industry, High precision machine tools and maintenance.